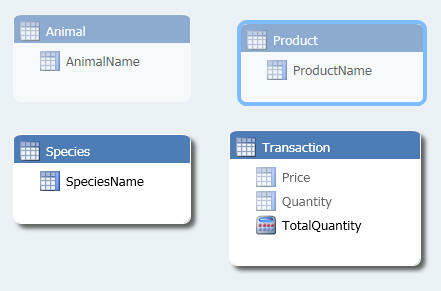 This page shows you how to set up and use perspectives in a tabular model. Choose to create a new perspective from the menu. 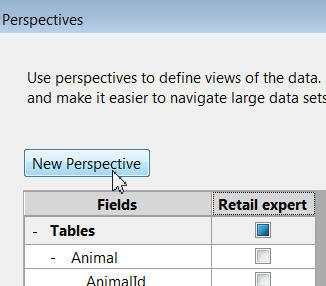 Here we've already created one perspective called Retail expert, and are about to add another. Here we're letting biologists view the classification of products bought, but that's about all. Simply click on the drop arrow and choose to view one of the perspectives that you've created. 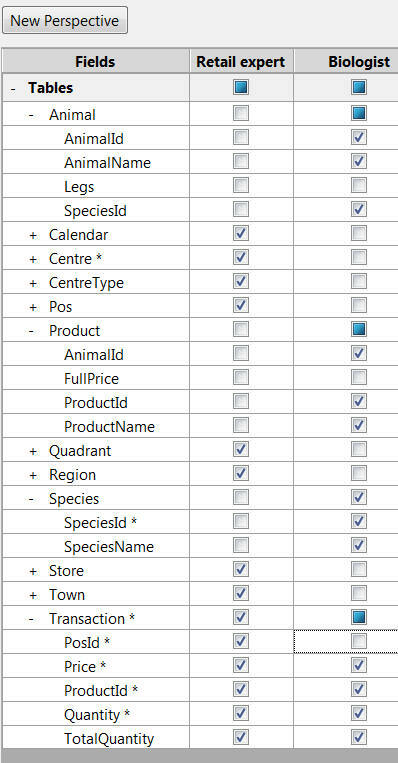 How the tables would appear if you'd unticked the id fields when creating the Biologist perspective. 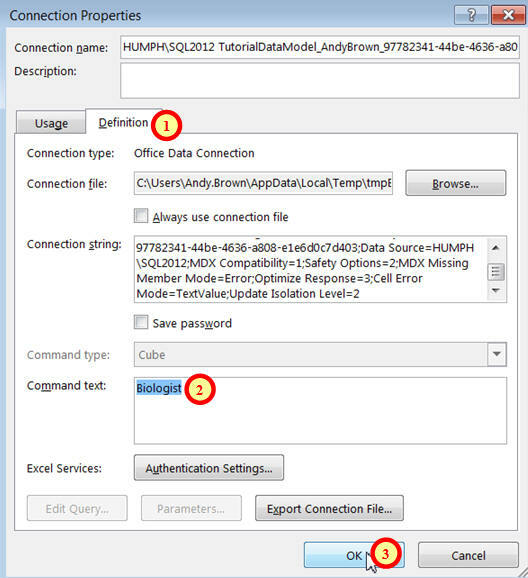 Even though you can't see the id columns or the relationships joining them, they still form part of your model, allowing you to aggregate data correctly. 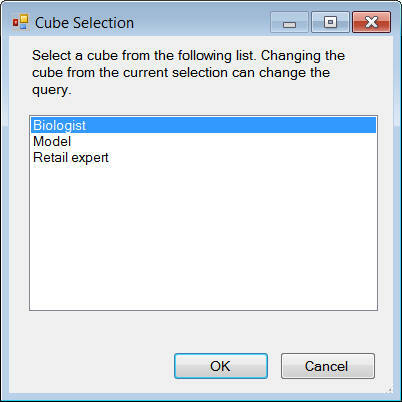 Choose from the drop down list who you want to be! You can only see columns which are included in the perspective and which aren't hidden from client view. 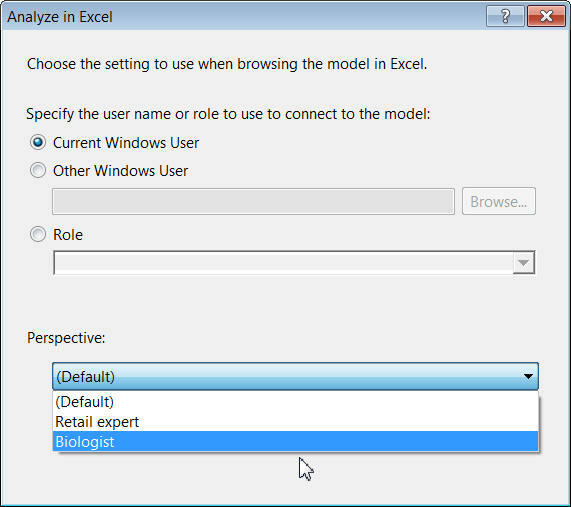 In Excel you'd first choose to click on this tool on the Data ribbon. Click on this button to change the properties of your connection. Step 1: click on the Definition tab; Step 2: type in a valid perspective name; Step 3: select OK. Note that you can also type in the command text as the word Model, to revert to viewing everything. 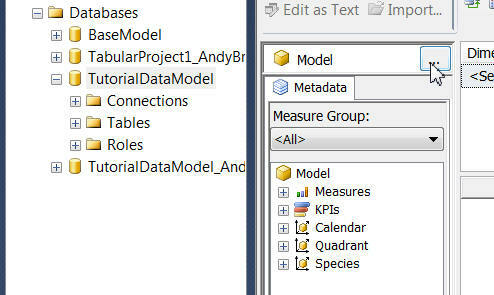 Click on the build button next to the word Model, as shown above. Choose which of the perspectives you've created that you want to use. And that's about everything you can do with perspectives. I really like the way Microsoft have implemented them: nice and simple, which is always a good thing in software.